Germany&#039;s Bike Autobahn provides a glimpse at what could be in B.C. The start of a new year frequently comes with the launch of exciting new ideas, and the world of two-wheeled transportation is no exception. As we returned to our regular routine following a relaxing holiday season, our social media feeds began to fill with news of an ambitious new project being built in Germany – a long distance, completely separated cycle-track affectionately coined as a ‘bike Autobahn‘. While there is an irony to the nomenclature – the original Autobahn was, after all, the inspiration behind North America’s vast freeway networks – the project itself will be the first of its kind. 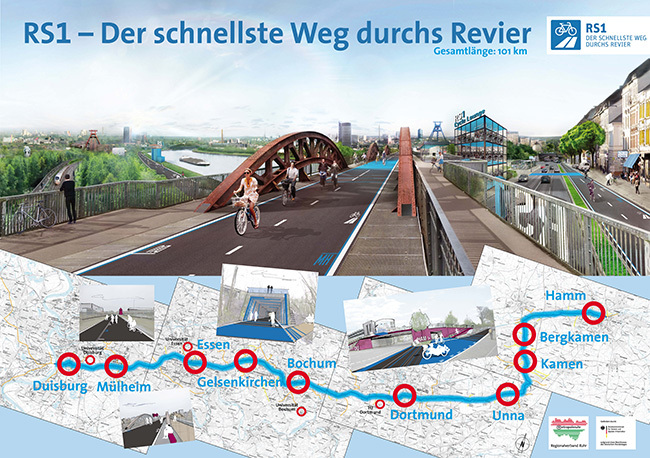 Upon completion, the route will stretch 101 kilometres, linking some of Germany’s most densely populated areas, with nearly two million people living within two kilometres of the ‘bicycle highway’. Authorities predict this single piece of infrastructure will remove 50,000 cars from the already over-taxed roads each and every day, for a fraction of the cost of an actual Autobahn. With just five kilometres built thus far, the world will watch closely to assess the viability of a network of cycle tracks built for long distance travel. Germany is one of the larger countries in Europe, and if successful, the ‘bicycle Autobahn’ could provide a framework for North America, including right here in Metro Vancouver. 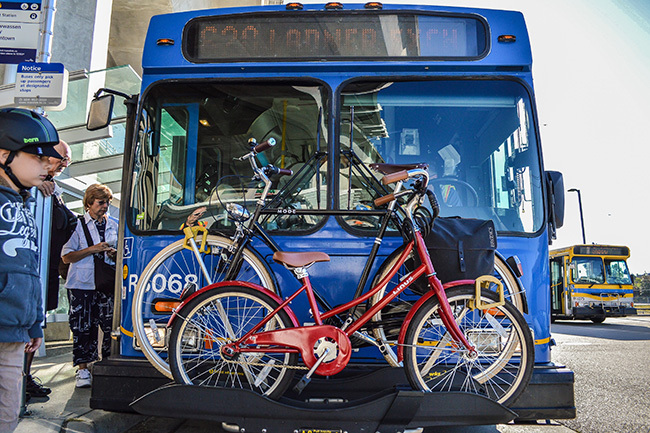 In a regional setting, despite chronic underfunding and frequent opposition, continued efforts are being made to safely connect our cities by bicycle. Most notably, we have the B.C. Parkway and the Spirit Trail, which serve as vital links between Vancouver and New Westminster, and North and West Vancouver respectively. But pedal beyond these cities, and suddenly the ease and comfort of your travel gets distinctly more difficult. At no time is this more apparent than when our family attempts to travel by bicycle to places like Steveston Village or Deep Cove. By necessity, parts of the trip include cycling in painted lanes along streets with traffic moving upwards of 80 km/hr – not very comfortable for the average adult, let alone the younger children. Our greatest challenge, however, is getting to either of the ferry terminals for cycle tours of Vancouver Island. In the summer of 2014, we travelled to Victoria by bicycle, and the ride along the Lochside and Galloping Goose Trails was a definite treat. On this side of the Salish Sea, however, no such pleasure was to be found, forcing our family of four to pair up and make the trip through a combined use of Skytrain and bus. And while that portion of our journey was relatively simple, we would have much preferred the option of cycling to the ferry, if a safe means was provided. 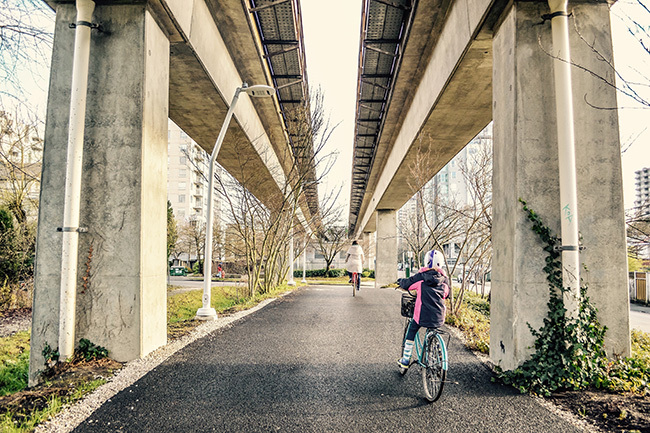 A long distance cycle track network, such as the one being built in Germany, could not only provide a necessary link from Metro Vancouver’s suburbs to city centres for the region’s many bike commuters. It could also provide a safe, reliable means for families like ours to travel beyond the city limits comfortably on two wheels. Imagine how this could alleviate congestion not just during work hours, but also during the weekends, when residents and tourists flock to these well-travelled destinations. Having another option could mean less circling of Deep Cove’s narrow streets in search of a coveted parking space, lessened wait times at the ferry terminal during high season, or an easier drive into downtown Vancouver. For families like ours, who choose more active means of travel, a ‘bicycle Autobahn’ would mean regional travel options beyond public transit and car share. The limit to how far we travel on a given day would be measured by our own capabilities, and not the level of safety afforded by that particular route. While the idea of a 100-kilometre cycle track seems lofty here in North America, the reality could be the difference between ever-increasing congestion; and healthier, happier, better-connected regions. 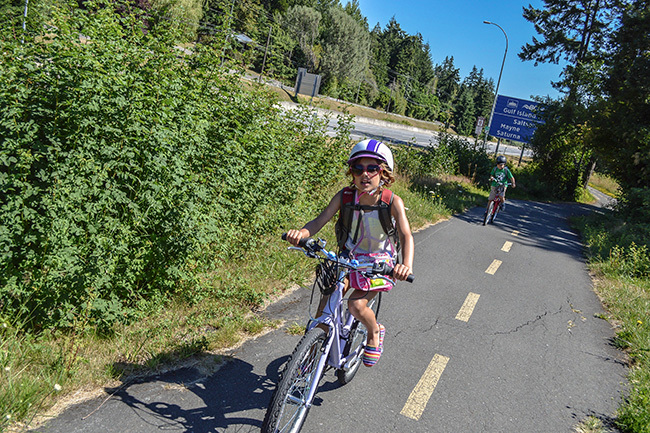 Want to encourage the provincial government to invest more in walking and cycling? Sign the British Columbia Cycling Coalition’s petition here: http://www.bccc.bc.ca/everyone.